Recently my mom was gifted some garden-grown butternut squash. She passed them onto me and I gladly accepted. I had never made butternut squash soup before so I knew this would be the perfect opportunity to try recreating this infamous Fall soup. I had to use up one and a half medium squashes so the recipe is written for that much. You may adjust the recipe accordingly if you want to make less soup. However if you make the recipe as is, you can definitely freeze a portion for another chilly day. The trick to bringing out the best flavour in your squash is to roast it. To roast, simply cut your squash lengthwise, prick all over with a fork, rub with olive oil, salt, and pepper and then bake in a 400 degrees Fahrenheit oven for one hour. 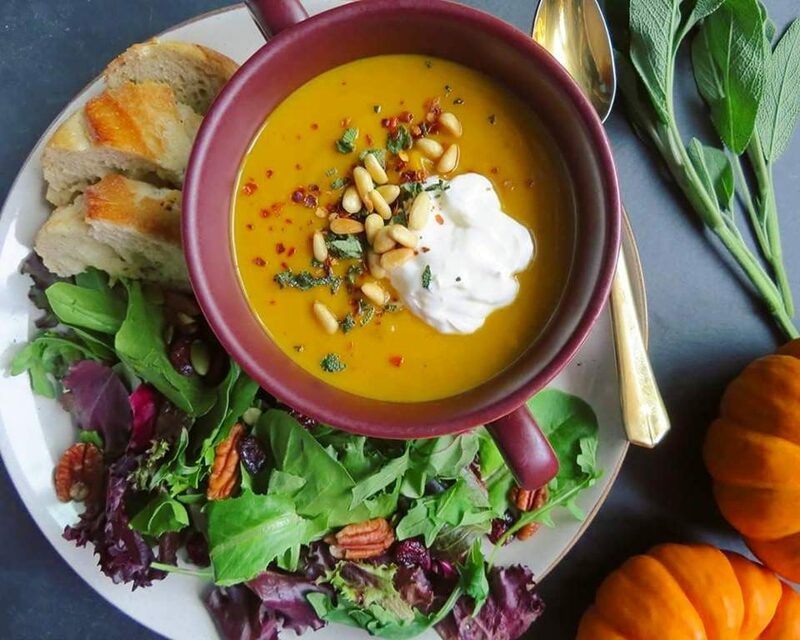 You will not want to miss this step as the roasted squash contributes to the hearty, sweet, and warm flavour of the soup. Fortunately, this part can be done in advance. 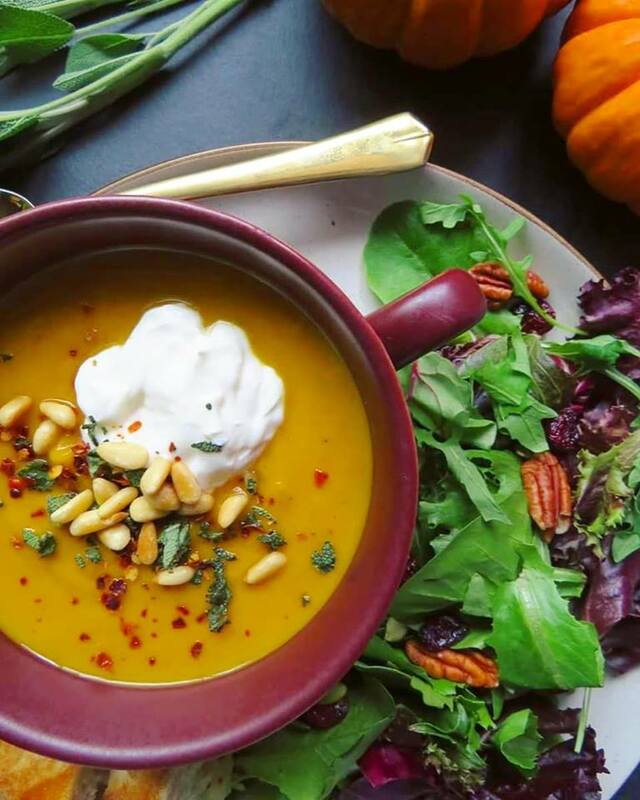 I added sour cream right into the soup for extra creaminess and topped our warm bowls of butternut squash soup with an extra dab of sour cream, chilli flakes, and toasted pine nuts. 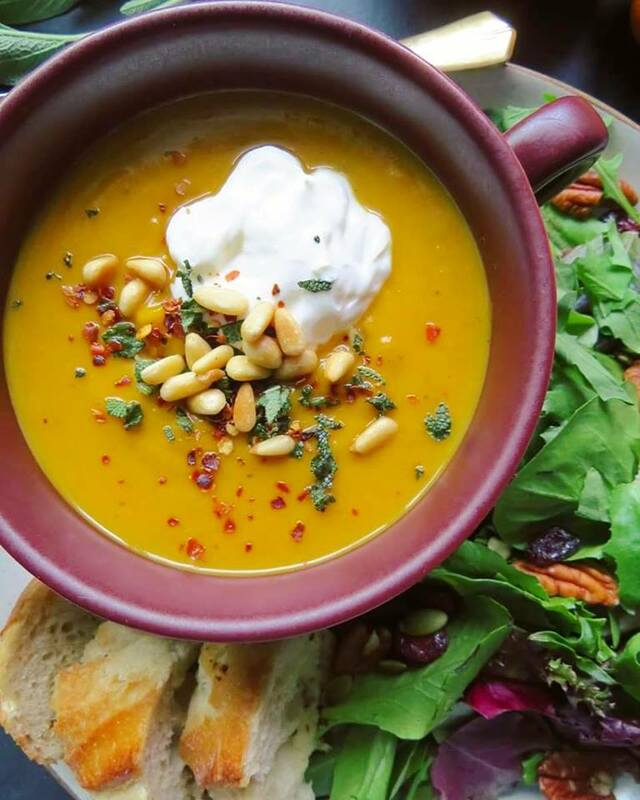 I served the soup with a nice Fall salad and a crunchy baguette on the side – bread makes soup even better! No matter which way you serve this soup, it is sure to please. In a large soup pot on medium-high heat, melt the butter. Add the onions, garlic, and sage, and sauté until the onions turn translucent. Add the grated apple and let cook for a minute or two. Add the chilli powder and cinnamon and sauté for a minute until the raw smell disappears. Stir in the mashed squash, broth, and salt and cover the pot. Reduce the temperature to medium heat and let the soup simmer for 20 minutes. Lastly stir in the sour cream and add the black pepper. Adjust seasoning if required. Once the soup cools a bit, use an immersion blender to puree the soup. To roast squash: Wash, dry, and cut your squash lengthwise. Discard the seeds. Prick the squash all over with a fork. Rub with EVOO, salt, and pepper. Transfer squash to a baking sheet and place in an oven that has been preheated to 400 degrees Fahrenheit for approximately one hour or until squash is soft and slightly brown and crispy on the top. Remove and let cool before peeling off the skin. Mash the squash and use as called for in your recipe. To thin soup, add more vegetable broth and simmer before serving. Sage has quite a strong smell, if preferred add parsley instead for a milder flavour.